“Did you pack this bag yourself?” It’s a question many of us are used to being asked when checking in at an airport. For a shipping container, the situation is more complex. Most organizations never communicate directly with the party that stuffed the container. Underpinned by blockchain technology, the TradeLens platform lays the foundation for global, digital supply chains. It connects all parties in the supply chain to drive true information sharing, foster collaboration and trust, and spur industry-wide innovation. Governments who embrace the opportunities offered by TradeLens place themselves in an ideal position to contribute positively towards a new era of global trade that is both frictionless and compliant. A buyer cannot be certain what is in the container until it arrives and is unpacked. An ocean carrier never sees the contents of a container and relies on documentation provided by the shipper or forwarder. Customs authorities can struggle to determine the buyer for certain imports. A study found that a single shipment of avocados from Kenya to the Netherlands involved 30 different organizations, over 100 people, and 200 individual information exchanges. Each information exchange risks the introduction of data inconsistencies. TradeLens reduces these uncertainties and inconsistencies by providing authorized parties with access to the original data; in this case, the actual information provided by the organization that stuffed the container in Kenya. TradeLens is a collaboration between Maersk and IBM. It is a global, blockchain powered platform that follows the flow of cargo from source to destination, and connects the various parties involved in a shipment. It is also an open, neutral platform that enables all organizations involved in an international shipment to simply and securely exchange shipment events and documents in real time, increasing the visibility that shippers have about the status, location, and contents of their consignment. In addition, platform participants can create additional apps that leverage the platform’s ecosystem and make them available through the TradeLens marketplace. This year, a ‘limited availability’ release of the platform was launched; a significant step in its evolution. It has already secured commitments to track approximately 20% of global ocean container traffic. With more than 90 organizations having agreed to participate on the platform, including three shipping lines – Pacific International Lines (PIL), Hamburg Süd and Maersk Line – and the Customs authorities in Australia, the Netherlands, Peru, Saudi Arabia and Singapore, Tradelens’ data is growing at a rate of close to one million events per day. TradeLens realizes the ‘data pipeline’ concept developed by respected career Customs officers, Frank Heijmann and David Hesketh, and others, which was explored in various European Union (EU) research projects, such as ITaide, Cassandra, and Integrity. Collaboration on TradeLens started in June 2016 and was known as Global Trade Digitization (GTD). The platform was used by CORE, an EU funded security project that included the Customs Administration of the Netherlands, US Customs and Border Protection, and the US Department of Homeland Security’s Science and Technology Directorate. Shared replicated ledger: Each organization that participates directly in the blockchain network operates a blockchain node. These nodes each maintain a copy of the blockchain. When data is added to the blockchain each node’s copy is automatically updated. Immutability: The blockchain network is append-only. Once data is published to the blockchain it cannot be changed. If there was an error in the data, then a new version must be added, with both old and new visible in the blockchain. Permissioned: The parties can be identified and only the parties participating in a specific shipment can view, submit or approve related data. This is very different from the blockchain network that lies at the heart of Bitcoin where all parties are completely anonymous. Channels: Divides the blockchain network into separate sub-networks. Data in any given channel is only distributed to nodes that are part of that channel. Selective endorsement: The reason that the TradeLens network will never suffer from the power consumption requirements that plague Bitcoin. Bitcoin must verify transactions whilst maintaining anonymity and uses a proof-of-work mechanism to do this. It is this proof-of-work mechanism that is the source of Bitcoin’s huge power requirements. TradeLens members are not anonymous, so a much more efficient selective endorsement approach can be used to verify transactions. Smart contracts: Pieces of software code embedded in the blockchain network. They encode the business rules for a particular transaction and can be used to implement automated processes that span national and organizational boundaries. The benefits of platforms like TradeLens are wide-ranging. 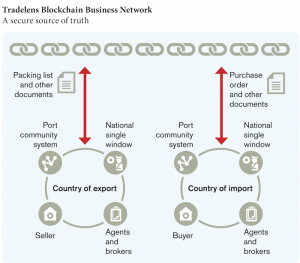 In many countries, it is still difficult for a trader to find a consolidated cross-agency view of the release status of a shipment. By publishing key events and information to TradeLens, Customs and other government agencies can improve the visibility that traders have about the status of their shipments. This helps the private sector to better plan its activities, saving both time and money. Platforms like TradeLens allow Customs and other government agencies to piggyback their supervision processes on top of existing commercial information exchanges. As soon as a container is stuffed in the exporting country, the importing country’s Customs agency could pull the purchase order and packing list from TradeLens and use them to perform a risk assessment on the shipment. 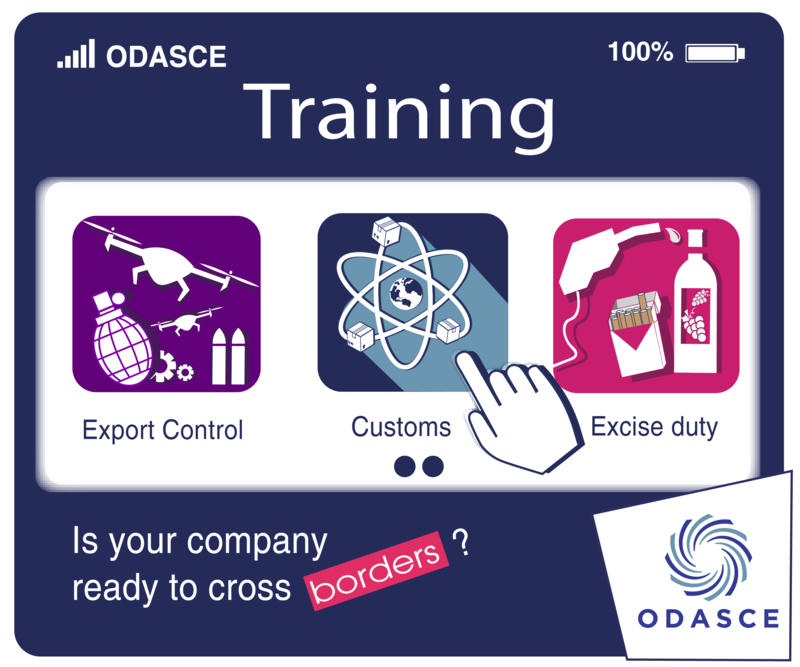 Access to earlier, more complete, immutable data improves the effectiveness of targeting processes, facilitating legitimate trade, increasing compliance and improving Customs’ efficiency. In many countries, initiatives such as national electronic Single Windows and port community systems have been successful in improving the efficiency and coordination of border processes. TradeLens can integrate with and complement these initiatives, providing access to its global network of members. TradeLens can also accelerate the emerging trend of connecting Single Windows or port community systems in order to create regional networks, by enabling these different communities to share data on a global scale. Since the 1970s, people have been boldly predicting the paperless office. Forty years on, paper documents remain prevalent in international trade. Bills of lading, certificates of origin, phytosanitary certificates… the list goes on. Blockchain platforms like TradeLens provide the ideal mechanism for digitizing these documents. Channels, permissions, and encryption ensure that even the most sensitive information can be kept safe from prying eyes. Smart contracts allow the creation of automated processes that cross national and organizational boundaries. For example, a paperless end-to-end process for phytosanitary certificates; from issuance in the exporting country through to verification in the importing country. In such a process, the approval of the certificate in the exporting country is visible in real time in the importing country, and the blockchain technology ensures that no one can alter the certificate. Nodes, channels, smart contracts, consensus… Implementing your first blockchain solution can require the learning of a whole host of new terminology and technology. It doesn’t have to be like that. Platforms like TradeLens package the blockchain technology and benefits into an easily consumable form. TradeLens members can connect to the platform using standard approaches such as web application programming interfaces (APIs). Or, they can use the platform’s out-of-the-box user interfaces. A Customs authority can establish a connection in a few days, with a small team, rather than requiring its staff to first invest in becoming blockchain experts. To further simplify adoption, TradeLens is committed to the promotion of industry standards and interoperability of platforms. It is continuing to align with relevant standards bodies such as UN/CEFACT as well as exploring blockchain specific interoperability mechanisms. By joining TradeLens, Customs authorities and other government agencies can immediately access more timely, accurate and verifiable data, and use it to improve their targeting and selection processes. This can facilitate legitimate trade and increase compliance. The team behind TradeLens looks forward to continuing to work with governments who embrace the opportunities that the platform offers. Together, we are shaping its future and ushering in a new era of global trade that is both frictionless and compliant.